Horror film Lupt is all set to provide chills to the audience on 2nd November. The film’s trailer gives a glimpse of how thrilling the journey would be that audience will embark upon while watching this gripping tale. Written and directed by Prabhuraj, The film stars two acting legends, Javed Jaaferi and Vijay Raaz in prominent roles. The interesting fact about casting the duo is that both will be seen in serious roles oppose to their comic image among the audience. The movie also stars famous television and film actress Niki Walia, along with Karan Aaanad who was last seen in Gunday, Kick and Baby. Rishabh Chaddha who appeared in movies like Drishyam, khoobsoorat will also be seen in an important role in the film along with Meenakshi Dixit among others. Lupt’s trailer went on to trend among the Twitterati moments later it was launched. Other than this the audiences also showered their appreciation on the makers for the conceptual teasers released by them starring Vijay Raaz and Javed Jaaferi. 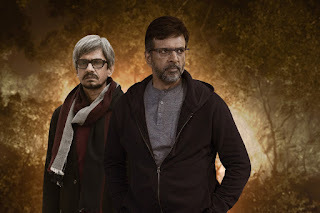 Lupt which is Prabhuraj’s directorial debut surely looks promising enough with its strong storyline and prominent casting and in the present scenario of cinema where slowly and steadily filmmakers are breaking the stereotypes to produce something new, Lupt, which is produced by Mr Hanwant Khatri & Mr Lalit Kiri under their banner Fun Entertainments certainly will be welcomed with much appreciation.